Cleaning up negative backlinks can help your website recover from Google algorithmic penalties. Backlinks are a very important Google ranking factor. However, creating low-quality backlinks is equally harmful to your website ranking. What is a Negative Backlink? Buying or selling links – a webmaster exchange backlinks either in exchange for goods or services for links. Link to me and I will link to you – Cross-linking to gain and manipulate Google algorithm. Backlinks created using automated software – Excessive amount of backlinks created using software and tools to improve ranking. How Can a Website Get Negative Backlinks? Sometimes competition of your website can build those backlinks to suppress your website in Google search results. Also, hiring an SEO specialist with limited experience can be a reason for poor quality backlinks. That’s why for any webmaster it is important to know how to clean up bad backlinks. How do I Find Out Negative Backlinks? You can use Google Search Console to find out which websites are mostly linking to your website. However, Google Search Console don’t always provide all the backlinks. You can use third-party tools such as Ahrefs and Semrush to find more backlinks. If you hired an inexperienced SEO specialist to create backlinks in the past, he might have given you email IDs and passwords of those accounts on which he created links. Important: Removing backlinks that are not actually bad links can hurt your website ranking. So use this tool only if your website has been penalized by Google. 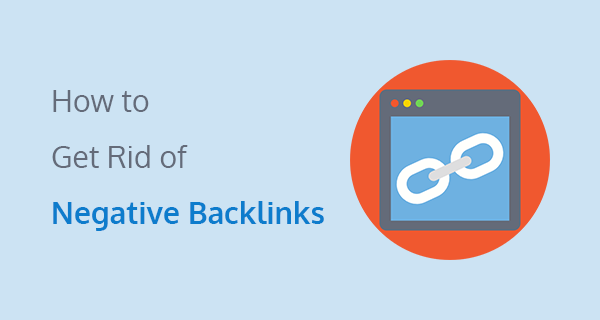 Google Link Disavow is the only tool that can help you get rid of bad backlinks. First of all, you need to find bad backlinks. I use Google Search Console for almost everything. So, in this tutorial, we are going to use that to find bad backlinks. Step 1: Log into your Google Search Console account. Click on Search Traffic then Links to your site. This will open up a new window, where you can find all the backlinks. In the ‘Who links the most’ tab, you will see a link with the anchor ‘more’. Step 2: Clicking on it will open a new page. Here you will find out all the domains that are linking back to your website. Step 3: Navigating all of these pages could be time consuming. You can download these results by clicking on the button ‘Download more sample links’. Important: Don’t include all of your backlinks to the Disavow link file. Only add negative backlinks to this disavow file. Step 1: In the previous step we downloaded a CSV backlinks file from Google Search Console. Now, we need to find out bad backlinks from this file. After that, create a text file using notepad (on Microsoft). Similarly, if you are using Mac you can use TextEdit. Step 3: Once you are done, save this file on your computer. 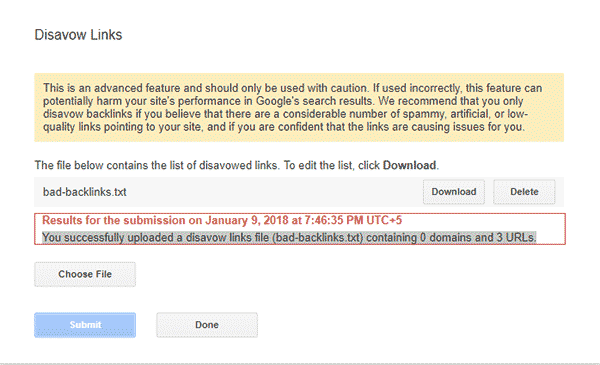 Now visit Google Link Disavow tool website. Select your property carefully (the website that has been affected with bad backlinks). Step 4: Clicking on ‘Disavow Links’ button will open up a new page, where it will show you a warning. Read that warning carefully and click on ‘Disavow Links’ button again. 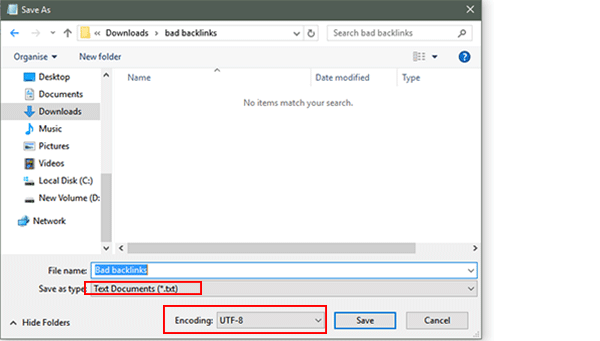 Step 5: Now choose a negative links .txt file from your computer and upload it. Click on the submit button and Press Done. Hopefully, this will clean up the bad backlink from Google index. You will get an email notification from Google Search Console. After that, you can file a reconsideration request to Google for removing the algorithmic penalty. If this article helped you clean up negative backlinks, then I am sure you would love to read these latest link building techniques to improve your domain authority.